Sonoma State University physics and astronomy professor Lynn Cominsky has received the $20,000 Wang Family Excellence Award for her extraordinary commitment to student achievement and exemplary contributions in her fields. "Receiving the Wang award is the biggest thrill of my career," says Cominsky. "It is wonderful to know that my dedication to the CSU is so widely appreciated and that my efforts to improve STEM learning nation-wide are being recognized." As a scientific co-investigator on three NASA high-energy astrophysics missions and founder and director of the Education and Public Outreach group, Cominsky develops exciting educational materials that inspire students to pursue STEM careers, to train teachers nationwide in the use of these materials, and to enhance science literacy for the general public. She has developed curriculum used by tens of thousands of students nationwide and has helped train master educators that have infused NASA science into the classrooms of more than 65,000 teachers. Cominsky was honored with the American Astronomical Society's Education Prize and the American Astronautical Society's Sally Ride Excellence in Education Award earlier this year. 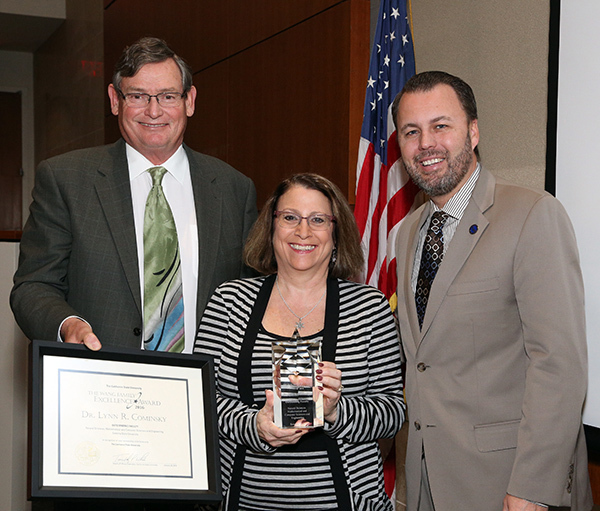 Four other CSU employees were honored with Wang awards. A media artist and leader of collaborative vision and social change, Diekman has more than 30 years of experience producing, directing and editing award-winning films and videos. Hamdan has been instrumental in securing grants exceeding $47 million to develop much needed teaching staff in high-need schools in urban and rural areas. As Executive Director of the University Student Union, Hammond manages the strategic direction and vision for the $14.3 million non-profit corporation, and serves as executive secretary of the Board of Directors. Segal founded the Twin Studies Center with the dual mission of fostering twin research by faculty and students, and providing information and support to interested individuals. The Wang Family Excellence Award recognizes and celebrates CSU faculty members who have distinguished themselves through groundbreaking achievements in their academic disciplines and who have an enormous impact on students through superior teaching. The awards for faculty are given to members of four groups of academic disciplines - Visual and Performing Arts and Letters; Natural Sciences, Mathematical and Computer Science and Engineering; Social and Behavioral Sciences and Public Service; and Education and Professional Applied Sciences. The award also pays tribute to staff members whose contributions significantly exceed expectations in their appropriate areas at the university. The awards are established through a gift from CSU Trustee Emeritus Stanley T. Wang and administered through the CSU Foundation. The honorees will be recognized on Tuesday, January 26, at a regularly scheduled meeting of the CSU Board of Trustees. Sonoma State University has received a $200,000 award from NASA to design, build and launch its second tiny satellite, this time to perform global monitoring of vegetation from space. Sonoma State University physics and astronomy professor Lynn Cominsky has received awards from two professional societies for her work in bringing STEM education to K-12 and college classrooms.